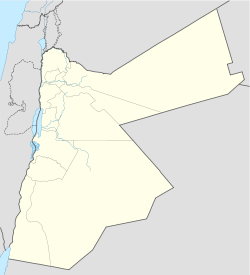 Al-Salt (Arabic: السلط‎ Al-Salt — pronounced Es-Sult or Es-Salt) is an ancient agricultural town and administrative centre in west-central Jordan. It is on the old main highway leading from Amman to Jerusalem. Situated in the Balqa highland, about 790–1,100 metres above sea level, the town is built in the crook of three hills, close to the Jordan Valley. One of the three hills, Jabal al-Qal'a, is the site of a 13th-century ruined fortress. It is the capital of Balqa Governorate. Clockwise from the left top: As-Salt's skyline, Great Mosque of As-Salt, St. George Church, Latin Church, As-Salt Castle, As-Salt Archaeological Museum, Al-Hammam Road and As-Salt Small Mosque . The Greater Salt Municipality has about 97,000 inhabitants (2006) of which 65% are Muslim and 35% Christians. It is not known when the city was first inhabited, but it is believed that it was built by the Macedonian army during the reign of Alexander the Great. The town was known as Saltus in Byzantine times and was the seat of a bishopric. At this time, the town was considered to be the principal settlement on the East Bank of the Jordan River. The settlement was destroyed by the Mongols and then rebuilt during the reign of the Mamluk sultan Baibars (1260–1277) and became a regional capital once more during the time of the Ottoman Empire. In the early 1830s, Salt was again attacked, this time being blown up during a raid by the Egyptian viceroy Ibrahim Pasha in his campaigns against the Ottomans in Palestine. Salt's heyday was in the late 19th century when traders arrived from Nablus to expand their trading network eastwards beyond the Jordan River. As a result of the influx of newcomers this period saw the rapid expansion of Salt from a simple village into a town with many architecturally elegant buildings, many built in the Nablusi style from the attractive honey-coloured local stone. A large number of buildings from this era survive as of 2009[update]. After World War I, the town was the site which Herbert Samuel, British High Commissioner of Palestine, chose to make his announcement that the British favoured a Hejazi Hashemite ruled entity on the East Bank of the Mandatory Palestine (current Jordan). This wish became reality in 1921 when Abdullah I became Emir of Transjordan. Salt seemed to be the city that would be chosen as the capital of the new emirate since most of the industry and commerce flowed through Salt. During this period Salt had no high schools. Even so, Abdullah picked the city as the capital of his emerging emirate but later changed his mind and moved his compound and entourage to Amman when he and the notables of Salt had a disagreement. Amman at that time was a small city of only 20,000 people which experienced rapid growth. Salt is famed in Jordan for its fertile soil and the quality of its fruit and vegetable harvests, particularly olives, tomatoes, grapes & peaches. Indeed, it is speculated that the town's name provided the root for sultana, a certain type of raisin. It is thought that the name Salt was derived from the city Saltos of the Roman Empire. Wadi Shu'aib (Valley of Jethro) is one of the largest agricultural sites in Salt city, a valley with large agricultural areas. It is named after one of the prophets in Islam (as well as Christianity and Judaism), Shoaib (Jethro), who was the father-in-law of Moses and one of the descendants of Ibrahim (Abraham). Most privately owned farms are located in this valley; the primary crops are grapes, olives and fruit-bearing trees. Salt contains many schools, including the public first secondary school of Jordan dating back to 1918, as well as many private schools that date back to the 1800s, such as the Latin School and the Catholic School. It is also the home of the Holy Land Institute for the Deaf, a non-profit educational center for people with hearing impairment. The city has two universities surrounding it: Al-Balqa` Applied University established in 1997 and Al-Ahliyya Amman University (Amman National University) located on the highway connecting Amman to Salt. An ancient town, Salt was once the most important settlement in the area between the Jordan Valley and the eastern desert. Because of its history as an important trading link between the eastern desert and the west, it was a significant place for the region’s many rulers. The Romans, Byzantines and Mameluks all contributed to the growth of the town but it was at the end of the 19th and the beginning of the 20th century, during Ottoman rule, when Salt enjoyed its most prosperous period. It was at that time that the Ottomans established a regional administrative base in Salt and encouraged settlement from other parts of their empire. As the town’s status increased, many merchants arrived and, with their newly acquired wealth, built the fine houses that can still be admired in Salt today. These splendid yellow sandstone buildings incorporate a variety of styles. Typically, they have domed roofs, interior courtyards and characteristic tall, arched windows. Perhaps the most beautiful is the Abu Jaber mansion, built between 1892 and 1906, which has frescoed ceilings, painted by Italian artists, and is reputed to be the finest example of a 19th-century merchant house in the region. Tightly built on a cluster of three hills, Salt has several other places of interest, including Roman tombs on the outskirts of town and the citadel and site of the town’s early 13th century Ayyubid fortress which was built by al- Ma’azzam Isa, the nephew of Saladin soon after 1198 AD. There is also a small museum and a handicraft school where the traditional skills of ceramics, weaving, silk-screen printing and dyeing are shown. Salt’s Archaeological & Folklore Museum displays artifacts dating back to the Chalcolithic period to the Islamic era as well as other items relating to the history of the area. In the folklore museum there is presentation of Bedouin and traditional costumes and everyday folkloric items. Wikimedia Commons has media related to Al-Salt. ^ "Salt Greater Municipality". Archived from the original on 2010-10-29. Retrieved 25 May 2018.